I know it's only February here in Washington, and we still have to scrap the frost off our windshields in the morning, but I've already started work on my garden for this year. From what I've heard from some of my gardening coworkers, you're really a gardener if you're already thinking about your plants in February. :: shrug :: That might be true. Or maybe I just have a disorder where I think about everything all the time, so it's less about me being a gardener, and more about me having impulse control issues when it comes to projects. 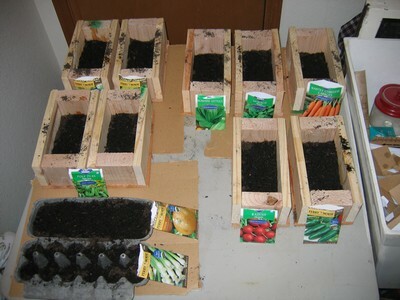 Most of the seeds I've purchased can be started indoors, six to eight weeks before the last of the frost. Since I have no clue when the last frost arrives, I just figured I'd start now and hope that things work out. I don't have a green house (although I'm considering building one), so I've decided to take up some space in our laundry room. It gets a reasonable amount of sunlight, and it stays fairly warm -- a good combination for plants, I hear. Hopefully the plants agree. I'm thinking about building a floor-to-ceiling series of shelves in the laundry room (shh... I haven't told my wife yet), so I can house a LOT of plants -- much more than the 11 small plots I currently have in the picture. We'll see. It might actually be less work to build the green house, and it'll likely cause less conflict with my wife. I realize that the plots are small. I'm still a beginner, and I don't want to have more than I can handle. Also, I plan to have several rounds of crops in succession, so after these plants are ready to transplant, I'll start the next batch. Hmmm. I think it is a bit weird that I am making comments two posts in a row (but I have a paper to write, which explains a lot)- you should definitely post about how the seedlings are going. I gave up trying on starting seeds indoors- they always did very poorly. I now stick with starting directly outdoors and transplants from the market. Have you read The Square Foot Gardner? I highly recommend it. I actually had a separate gardening blog on here last year, but I wasn't sure how to organize it, and it became more work to maintain than it was worth. I'm just going to periodically post on the progress and take pictures, maybe once every couple of weeks, or whenever something exciting happens. Speaking of which, radishes, sprout very quickly. The seed packet says I can harvest them in a month... and after a single day, I already saw one breaking through the dirt. Crazy. Scarymelon -- are you sure that you've got the title of that book correct? I'm not getting any luck finding it. aha! It's listed for 75 cents plus shipping on half.com, so I may buy it. Looks interesting... thanks for the tip! I suspect we'll get our last frost here pretty soon; you should be good by the beginning of March. Our tulips and crocuses are starting to come up--it's really nice to see some color right now. In any event, I can check the weather forecast every night and see if it's supposed to freeze. My planters are small enough to move in and out, so if it's gonna be cold, I can bring them inside for the night. My radishes are growing like CRAZY. I had no idea that they grew so quickly. The romaine lettuce has also sprouted up. Fun!